Huda Kattan’s new beauty launches this autumn have left me wanting to buy and try more from her award-winning makeup line. Not only have the Obsession palettes bowled me over, the #FauxFilter Foundation* has pleasantly surprised me. #FauxFilter may sound like a load of nonsense marketing but never has a matte foundation been more flawless without sucking the life outta my skin. It’s as close as I’ve got to an Instagram filter IRL and I’m digging it. However, there’s one caveat; the coverage is heavy (but note: not mask like, think MAC Studio Fix Fluid) so application requires a little work and extra help from a hydrating primer, especially if your complexion is on the drier side, so in short it’s not a chuck on job done kinda foundation. But when my skin doesn’t resemble the Sahara Desert, boy does it deliver. It’s the most highly pigmented foundation I’ve ever tried, trust me a single pump will do the trick at concealing redness, blemishes and everything else in-between. It has a healthy satin finish, that doesn’t go chalky after a few hours wear like Estée Lauder Double Wear and loose powder isn’t a necessity when wearing #FauxFilter, because it wears pretty well and still looks good by 6pm. The liquid foundation does have a floral scent, but it doesn’t bother my nose, or my skin, so I can look past that. But it does have an admirably wide shade range, with 30 to choose from, but be warned the formulation oxidises, so opt for a shade lighter. 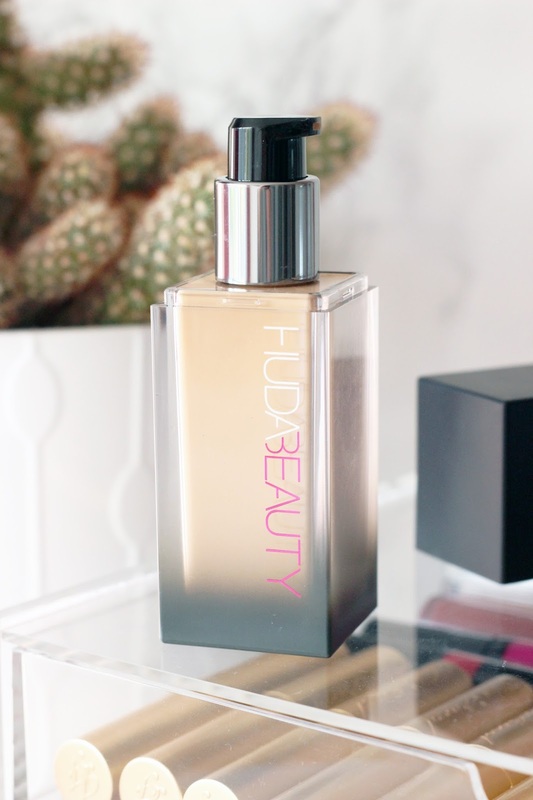 All in all, it’s no surprise Cult Beauty has found it difficult keeping Huda’s first foundation in stock. So if you like full coverage radiant makeup, this could be your pick for the party season and the best part? I’ve just checked and Cult Beauty now has every.single.shade available. Have you tried the Huda Beauty #FauxFilter Foundation?